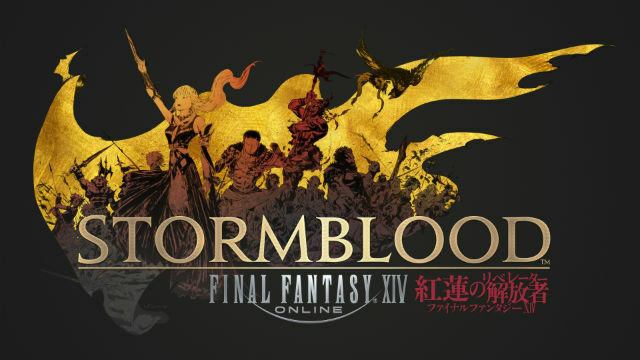 The latest patch for Final Fantasy XIV Online: Stormblood has arrived and with it a brand new land for level 70 adventurers to explore. The lost island of Eureka awaits players brave enough to explore a large open world map filled with challenging monsters as well as the return of a mechanics from both the 1.0 days of FFXIV and systems from Squeenix’s sibling MMO Final Fantasy XI! Before discussing how Eureka’s new systems work and what it feels like to play for an extended period of time, there’s some background information that I need to get out of the way. 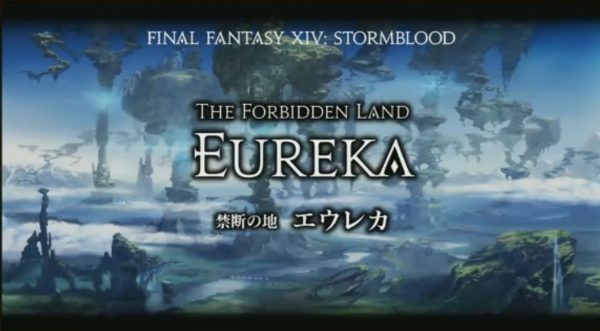 The lost island of Eureka is a direct replacement for the Relic Weapon quests that were present in Final Fantasy XIV: A Realm Reborn and Final Fantasy XIV: Heavensward. In those quests you’d go to existing zones from the current version alongside farming older content in order to complete the steps required to get your glowy relic weapons. Eureka takes this idea and advances it one step further by melding in mechanics from the Heavansward group content known as The Diadem from Patch 3.1. Field Area-Style Gameplay: Up to 144 players can participate. Players are encouraged to group up with fellow adventurers to hunt notorious monsters and work towards common goals. Player Progression: Players will gain elemental EXP to strengthen their ability to harness the elements, but will need to be careful. Death in Eureka will result in lost EXP, and even lost levels, if players rashly rush in. Altered Battle Mechanics: Additional strategy is required in battle through an element system, in which players must utilize the Magia Board to change the element affinity of their attack to oppose their enemy’s. Players will customize their Magia Board’s elemental attributes and must carefully consider their setup depending on the goal of the adventure. For two hours this afternoon I took my level 70 Machinist, Reka Ai’a, along with my wife’s lvl 70 Paladin out to the forbidden land of Eureka to experience the changes in combat first hand. In other open world content in XIV a level 70 character can pretty much be guaranteed to shred any mob that stands in your way, although with multiple mobs this can get a little dicey. Right off the bat I could tell that this is not the case in Eureka. The island’s open fields are littered with monsters that if you’re not careful will not think twice about teaming up to stop you dead. Unlike other instanced content in FFXIV being “level 70” doesn’t really mean much since Eureka has its own experience and leveling system known as the “elemental leveling system”. A single mob will kill you if you don’t pay attention to Eureka’s unique mechanics (more on this in a little). Defeating mobs in Eureka (carefully) will obviously award you experience points but the gain rate isn’t the same as the base game. Instead of requiring hundreds of thousands of experience points the level up, the jump from level 1 to 2 is somewhere in the range of 1,000 or so elemental experience points. Accordingly the amount of experience earned from defeating mobs is drastically reduced when compared to base XIV and more so when compared to leveling low level jobs in XIV. Soloing Eureka content I found that I was gaining between 20 – 45 EXP per level, which sounds like a tedious grind. This is because the EXP rates in Eureka rise with a “chain bonus” similar to the one you get in dungeons for killing mobs in quick succession, but only when you are partnered with another player. Chain bonuses can work their to a 30x multiplier before eventually resetting back to 1. 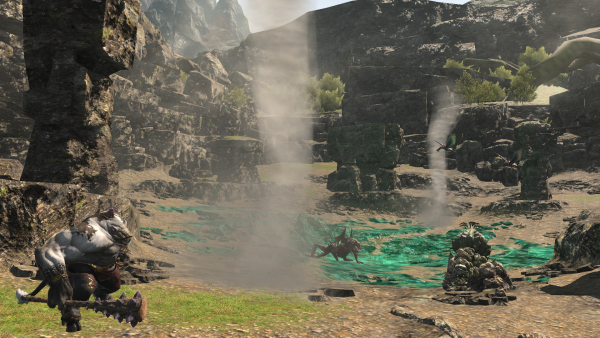 With an organized team or just a single other player to play with Eureka’s leveling experience can feel rewarding and challenging without feeling like a slog. In the two hours I played today I got to level 4 – so about a level every half hour, not too bad. This brings me to the most striking difference between Eureka and the core leveling experience to be found within any of FFXIV’s other encounters – the elemental level system. Due to some really awesome lore that I won’t spoil here, the aether on Eureka is all sorts of messed up. Monsters are a lot more powerful than their Othard or Aldenard counterparts and even the Warrior of Light’s power stands little chance against them. 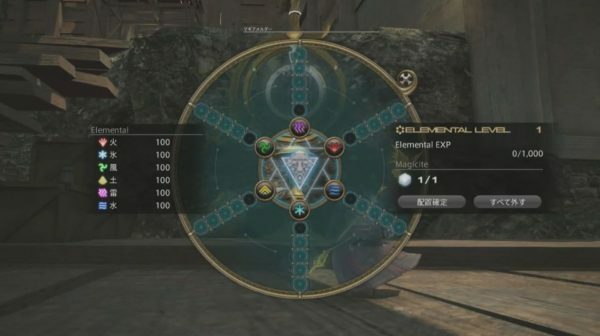 To combat this threat Geralt and Krile have devised an “elemental wheel” which will grand you attack bonuses and defense bonuses towards certain elements. It’s almost like the meta-game of Pokemon: Fire beats Water, Wind beats Earth etc. UI elements on your HUD will show you which element you’ll need to aspect into for either attack or defense and the key to survive encounters is swapping between these attack and defense buffs for each of your encounters at the right moment. It adds a bit more nuance to the moment to moment combat of FFXIV and once I got the hang of it, I was really enjoying it. Lastly I’ve come to the inclusion of Notorious Monsters, super powerful boss-like creatures that occasionally spawn in Eureka’s over world. 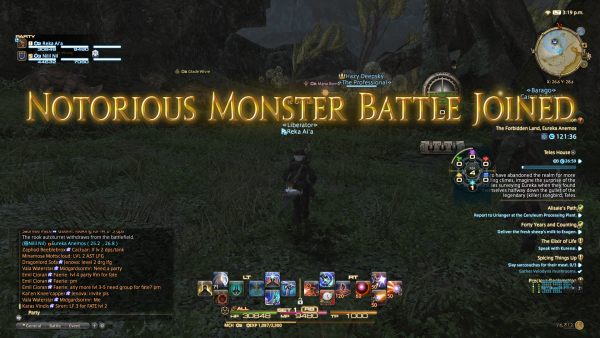 The name Notorious Monsters comes from both Final Fantasy XI and Final Fantasy XIV 1.0. 2.0+’s A Rank hunts were similar to these new NMs but unlike their ARR+ brethren, Eureka’s Nortious Monsters get their own map marker and FATE spawned as soon as they enter the world. No need to sit in shout chat and hope someone calls out the location of the challenging MOB – where should you miss an A Rank you’d have to wait possibly days for a respawn. NMs in Eureka are large events with dozens upon dozens of players all vying to take part in the monster’s destruction. NMs have high health pools and mechanics that if done incorrectly can one-shot entire swaths of players. At times with so many players present it can feel like “effects soup”, so be prepared to think fast and maybe turn down your graphical settings. Outside of Savage, it’s probably one of the most challenge things right now – especially while the community figures out the unique mechanics per mob. After the large monster goes down you’re rewarded with special crystals that can be turned in towards Relic Weapon steps and special lock boxes that have a chance to contain a Eureka exclusive glamour or a T-Rex mount. Best of all NMs spawn so frequently that I saw a number of them during my time on the island. That about wraps up my introductory coverage of Eureka, I’ve still got about 4 levels to go before I encounter the much feared “level down” mechanic, so expect another long winded blog entry sometime in the coming weeks. My journey towards GDC also begins tomorrow – so it could be a little while before I get a chance to take the ferry to the island of Eureka for an extended stay. What do you think about Eureka? Let me know in the comments.